A new archbishop of Rwanda will be elected on September 17. The serving primate is Emmanuel Kolini. 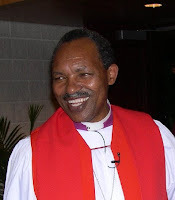 He was born in 1945 in Congo, ordained in 1969 and consecrated Assistant Bishop of Bukavu, Zaire in 1980. He served as Bishop of Katanga, Zaire from 1986 until 1997 at which time he was called into Rwanda as Bishop and Archbishop. His education was at Canon Warner Memorial College, Bishop Tucker College and Balya Bible College in Uganda. He and his wife Freda have eight children. Having become Primate of the Province following the years of genocide, Archbishop Kolini has been a major force for reconciliation in Rwanda. As the newly appointed Archbishop of his native Rwanda, Kolini was the first leader from any denomination to offer a public apology for the failure of his church to respond immediately to the genocide of 1994-a murderous spree that was carried out with shocking, sickening efficiency while the rest of the world carried on with "business as usual." Kolini inherited a region steeped in pain and bitterness, one in which many of the bishops had long since fled the country and the traumatized people were desperately in need of a shepherd. With God's help, he has met every challenge. Above all, the success of Kolini's ministry rests on his unwavering commitment to obey the Scripture-a stance that many within the embattled Anglican church have been longing to see. He speaks with the voice of a prophet calling his people to return to biblical truth and is one whose example of personal sacrifice has earned the respect of the world. In a move that turns the North American stereotype of world missions on its head, a growing number of American congregations are choosing to place themselves under the authority of Kolini's province and the missionaries he and other archbishops in the developing world have sent through the Anglican Mission in America. Times of war, oppression, and adverse living conditions can break a man-or they can forge him into the leader for which the world has been waiting. From the villages of Africa to the gleaming sanctuaries of North America, Archbishop Emmanuel Kolini is that leader.